A new version of GPU Shark is available. GPU Shark 0.7.1 adds the support of GeForce GTX 780, GeForce GTX 770 and Radeon HD 7990. 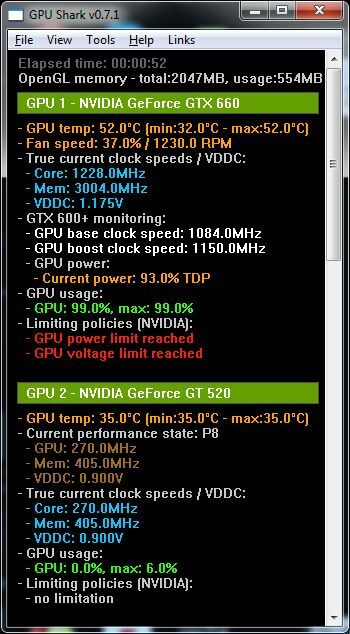 With this information you can now adjust the power target or temperature target to get more performance using EVGA Precision or MSI Afterburner for example..
GPU Shark 0.7.1 comes with a handy feature: the possibility to copy (with CTRL+C) all data to clipboard so you can quickly copy and paste GPU data where you want. added display of limiting policies for NVIDIA GPUs (GPU Boost). 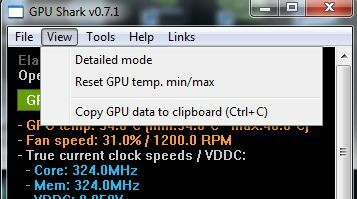 added the copy to clipboard (Ctrl+C) for all GPU data in View menu. added entries in the database for Intel Haswell GPUs (HD Graphics 4000 / Iris Graphics 5000). added support of NVIDIA GeForce GTX 780, GeForce GTX 770 and AMD Radeon HD 7990. (two similar video cards needed) but what about two different cards? Why set up such configuration? Can you explain me the goal (and/or pros and cons), please? It’s because on PC you can do what you want. You are not limited to a SLI or Crossfire system, fortunately. 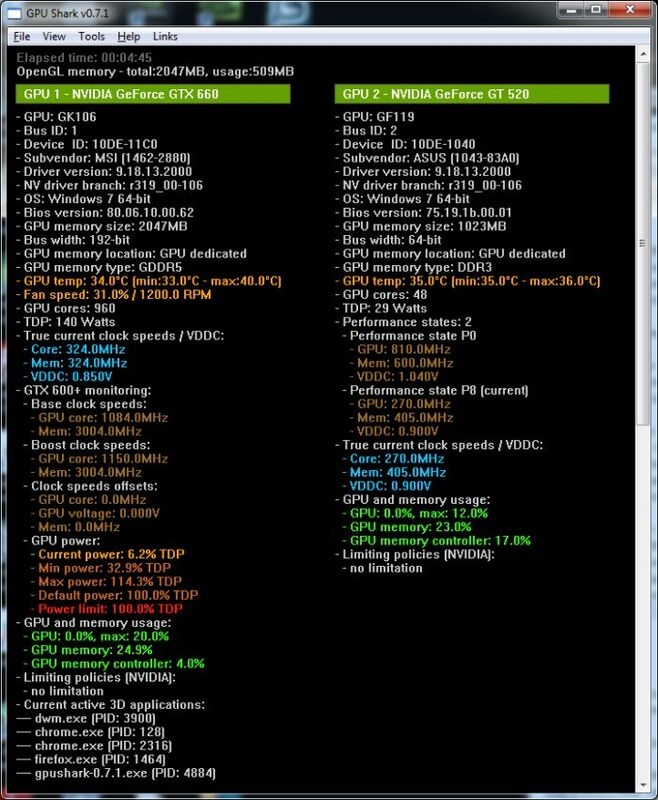 Two monitors on a single high-end NVIDIA card increase the GPU core clock (actually that was true few years ago, and I didn’t re-test but I supoose it’s still true). So to plug two or three monitors (I have three monitors) I simply added a second entry level card (GT 520) that handles two monitors while the main GPU (a GTX 660) handles the main monitor. 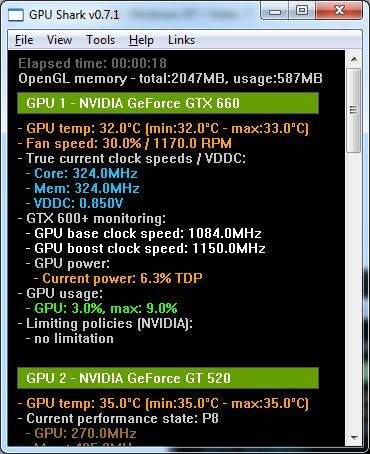 The GT 520 does not require external power connector and is passively cooled which is perfect because I have an fully open case (no tower) just above my head… A second card is also handy for PhysX or OpenCL tests or for testing my GPU monitoring code. And for real SLI/CrossFire tests, I have dedicated testbeds for that purpose.